Save time, money and energy with this high-capacity colour 4-in-1 printer, offering increased productivity and reduced intervention for busy offices. Streamline document capturing and distribution, increase productivity, reduce intervention, printing costs and environmental impact with this scalable and versatile business multifunction. 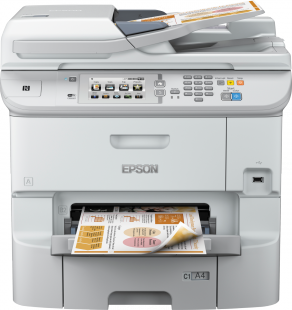 With advanced 4-in-1 copy, scan, fax and colour duplex printing features, the WF-6590DWF promises fast scan speeds and a first page out time of just seven seconds. With up to 80% lower energy consumption than competitive colour lasers2, the WF-6590DWF cuts your environmental impact. Relying on clean technology, it produces no fan noise when not printing, no heat and no ozone gas. With an up to 50% lower cost per page and a lower total cost of ownership compared to competitive colour laser printers3, the WF-6590DWF will save businesses money. Duplex printing and copying also saves paper. 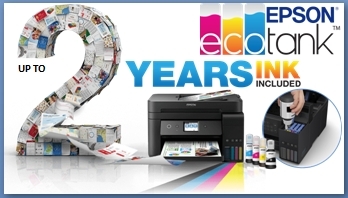 Using Epson's XXL ink cartridges, you can print up to 10,000 pages in black and 7,000 pages in colour, which is equal to or better than colour laser equivalents4. The maximum paper capacity of 1,581 pages means less time spent refilling. With a colour first page out time of just seven seconds1, the WF-6590DWF is perfect for printing small print jobs quickly. Fast scan speeds and one-pass scanning make jobs even more efficient. IT departments can take full control, customising it to automate job profiles and workflow processes using Document CapturePro and ProServer software5 and connecting to most document management systems. Print and scan to the WF-6590DWF wirelessly with NFC pairing from Android smart devices, or email documents from remote locations for instant printing on the WF-6590DWF6. Epson Device Admin makes it easy to manage a fleet of devices remotely.